Suciu Popa was founded in 2016 when two long-standing partners at Romanian firm Mușat & Asociații, head of international arbitration Luminita Popa and M&A and energy specialist Miruna Suciu, broke away to set up their own shop. Popa played a central role in developing the arbitration practice at Mușat over more than a decade, earning that firm a place in previous editions of the GAR 100. She brought a team with her, including partner Madalina Berechet, and the young practice already has a busy portfolio of cases. Roxana Fercala, who was promoted to partner in 2017, is another name to know in the international arbitration team. International clients include Enel, SABMiller, Engie, TNT, Müller Dairy, Hochtief, Roche and the Carlyle Group. French engineering group Colas is using the firm on a US$22 million ICC claim against Romania arising out of a road-improvement contract. Among its other clients are Romania’s state-owned Hidroelectrica, Black Sea Oil & Gas, Kazakhstan’s national gas company KazMunaiGas and SIF Transilvania, one of Romania’s largest investment funds. One eye-catching result was for Enel in 2016, in a matter that Popa brought with her from Mușat & Asociații. She helped the Italian energy firm defeat a US$1.2 billion ICC claim by the Romanian government for alleged breaches of a privatisation agreement for the country’s national power company. In a follow-up case, Suciu Popa teamed with Clifford Chance to act for Enel in an ICC arbitration with a Romanian state entity concerning a put-option clause, which ended in 2017 with an award requiring the Italian group to pay €401 million. Romania had argued the disputed shares were worth more than €522 million. Suciu Popa won a €8.5 million award for clients Colas Rail and ISAF against the Romanian National Railway Company in a dispute over a contract to rehabilitate a portion of the country’s most important railway line in 2017. Further related ICC proceedings are ongoing. The firm also clinched a win for Colas in Geneva-seated ICC proceedings against Romania arising out of a FIDIC contract concerning a road infrastructure project worth €22 million. The firm is acting for Italian contractor Taddei in UNCITRAL proceedings arising out of FIDIC contracts for road infrastructure projects in Moldova with a value of more than €5.5 million. It is also acting for Spanish infrastructure company Azvi in international arbitration proceedings under the Rules of the Court of International Commercial Arbitration in Bucharest, again relating to a FIDIC contract. Suciu Popa has been established in February 2016 by Miruna Suciu and Luminita Popa, two recognized practitioners with over 16 years of experience in international transactional practice and international disputes. A full-service law firm, Suciu Popa has a prominent international arbitration practice, with a strong track record of successful awards in complex international arbitration proceedings governed by the rules of ICC, ICSID, UNCITRAL, LCIA. Suciu Popa provides full legal services in the area of dispute resolution, being a law firm of choice for global players and leading local companies for international or domestic dispute resolution. Our dedicated international arbitration team is working on a significant number of energy & natural resources disputes, as well as cases involving complex construction and real estate contracts, infrastructure projects, M&A disputes, international commercial agreements and bilateral investment treaties. 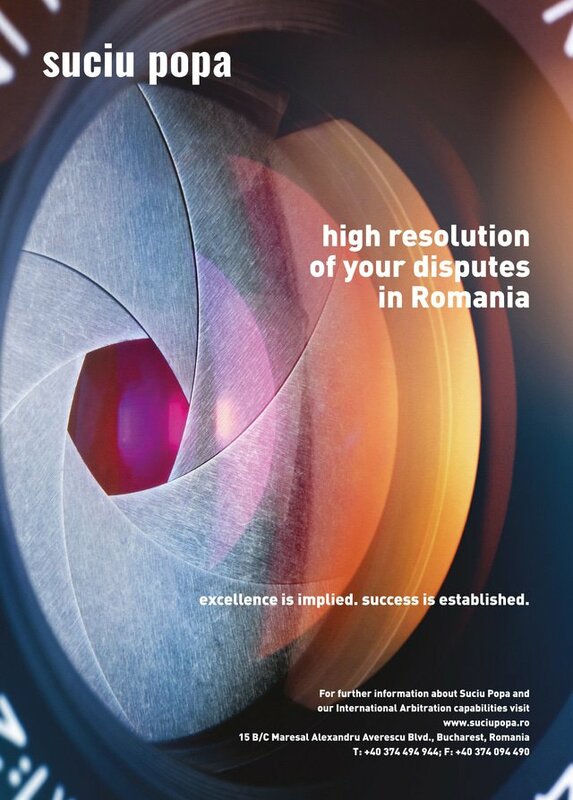 As a specific highlight, the firm has secured a fully successful award for a worldwide leading utility company in the largest ICC arbitration case involving the Romanian market (exceeding USD 1.2 billion). Suciu Popa is ranked as top tier firm in Legal 500 EMEA, IFLR 1000 Financial and Corporate and in Chambers & Partners, in areas such as Dispute Resolution, Energy & Natural Resources, Corporate/Mergers & Acquisitions, PPP and Public Procurement, with Luminita Popa being also ranked in Who’s Who Legal: Arbitration - Future Leaders 2017 and Who’s Who Legal: Arbitration 2018.